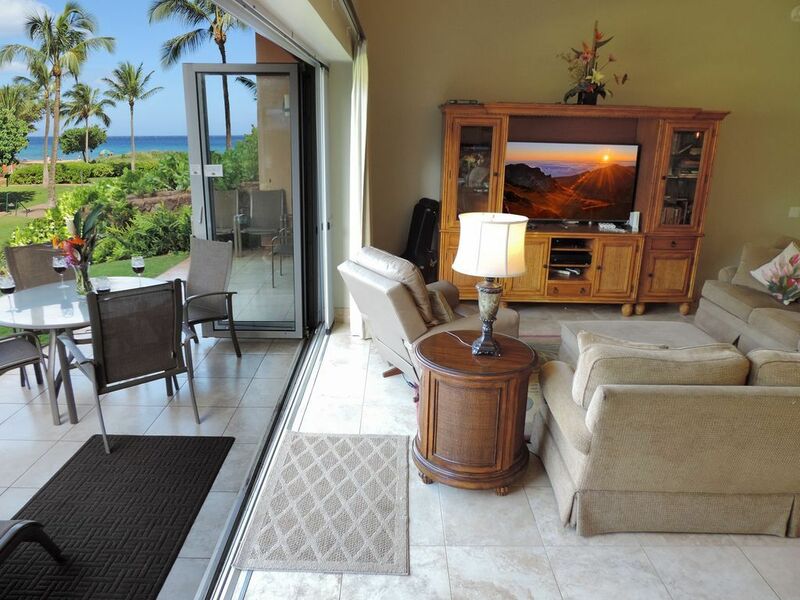 • Steps to the Beach – As seen, you'll walk right out from this ground level residence and you're only steps to the world class 3-mile long Ka'anapali Beach. We love taking the long walk to Whalers Village. • Elegant Beach Decor — Fitting for both the beach and a world-class resort, we've furnished our unit with beautiful Tommy Bahama furniture to create a relaxing yet elegant feel. • Honua Kai Resort — The new $400-million development is situated along nearly 40 beachfront acres on Ka'anapali Beach, one of Maui's best snorkeling and dive locations. It is the first whole ownership resort and spa development of its kind to open on Ka'anapali Beach in more than 25 years. We had an amazing time in HK104. This accommodation was exactly as we had hoped. The views were great, spent many mornings watching the whales spout offshore. It is located a very short walk to the water, both ocean and pool. It opens up to a quiet courtyard and is very peaceful. The amenities were really helpful and make this condo vacation ready for a family. If you're worried about the construction taking place, worry no more. You are nowhere near this by sight or sound. Just sit back and enjoy your time! Aloha!! Thank you for the amazing review ! We have a youtube video called Honua Kai construction update 2019. The open courtyard of this suite is great for families with kids and like the title says only 99 steps to the beach. Our family of 7 throughly enjoyed our stay here. It was very comfortable and welcoming. Great location!! Loved that we were literally steps from the pool and Beach. Our family of 8 had a wonderful time in this beautiful home! All of our needs were more than met. The owner's assistant, Sherry, was a dream to work with in terms of clear communication, answering our questions, and just general good will. We highly recommend this lovely property! We absolutely loved staying in H-104; so convenient to everything! The grounds at Honua Kai Resort & Spa are beautiful and well kept. Having the option to spend time on the beach or at any of the pools available is a very nice feature. The unit is spacious and has most everything you need for your stay. The convenience of walking right from your unit to anywhere on the property or the beach is fabulous! We will definitely be back to this beautiful paradise! We had a fabulous time at 99 Steps to the Beach. The property was lovely and ideal for families! We were thrilled to stay at this property and definitely would come back again. The condo was well furnished and very clean. Our family really enjoyed the easy access to the beach and pool. Thank you for a wonderful vacation! We had an excellent time at this location. We had three grown children and our 11 year old with us and everything was perfect! Monte met us on the first day and gave us an overview of the condo. He checked in periodically to make sure all was well. Great location, great amenities. We will definitely book it again!